I always wanted a Hammond organ and started with a free E-312 that needed repairs. I later found a great 1959 B-3, a 1952 M-2, and four Leslie speakers. My son bought a M-100 so I am now pretty familiar with repair and restoration of Hammonds and Leslies. 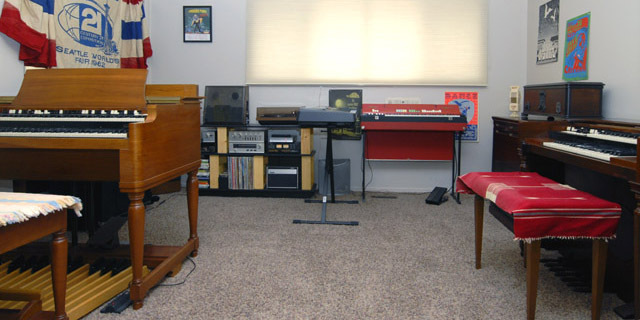 Also in this room is my 1966 Farfisa Combo Compact, 76 key Yamaha PSR-GX76, and my vintage stereo. As I was working on my M-2 and I thought that the tone wheel generator chassis was dusty. When I went to clean it I found that it was covered in whiskers. Zinc whiskers are crystalline structures that grow in the shape of a thin hairs emerging outward from a zinc surface. Every metal surface of the tone wheel generator is covered. The exact mechanism for whisker formation is unknown. I've also discovered that my Hammond B-3 and M-3 tone wheel generator chassis have similar zinc whiskers but not to the extent of the M-2. There are some additional zinc whisker photos on my Hammond M-3 tonewheel generator photo page. Whiskers are sometimes confused with dendrites which grow in snowflake-like pattern along a surface. Dendrite growth requires some type of moisture capable of dissolving the metal into a solution of ions which then redistribute due to an electromagnetic field. 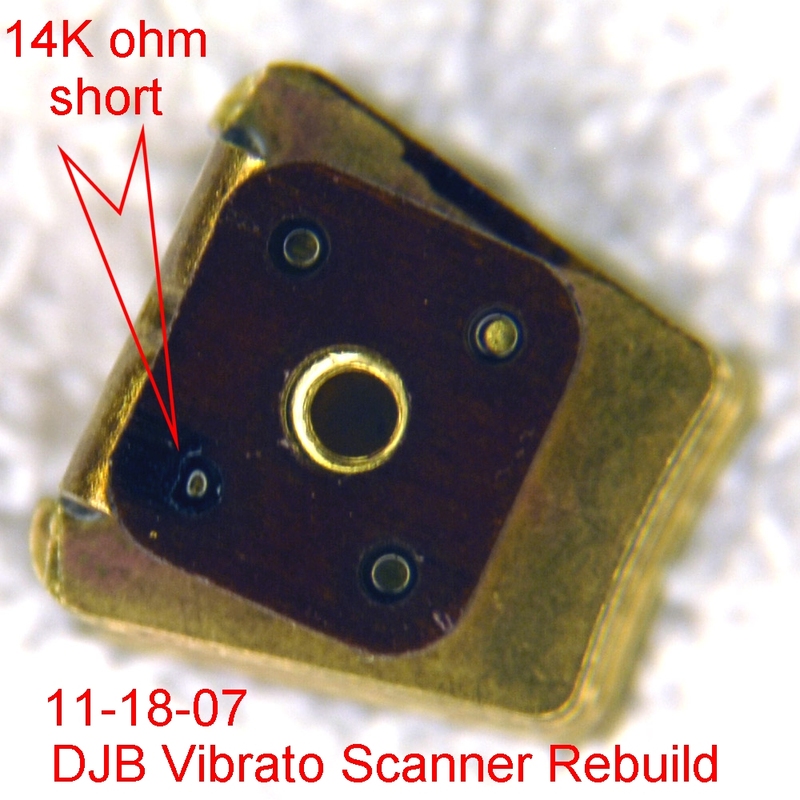 My B-3 vibrato scanner had a capacitor section with resistance to ground due to dendrite growth. 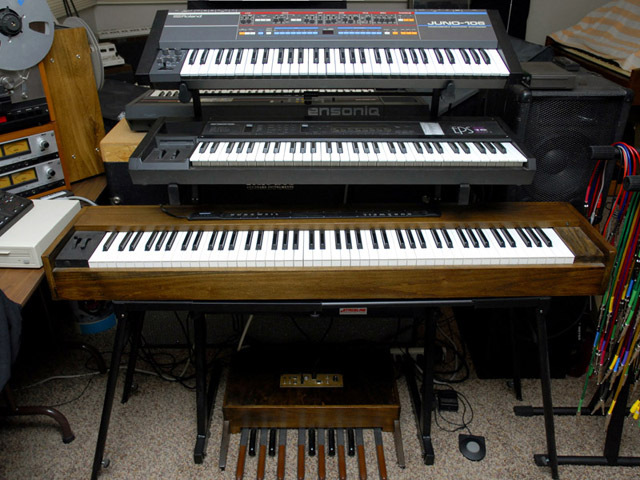 Two other Hammond-related projects utilize the vibrato scanner. I rebuilt a spare Hammond B-3 vibrato scanner and an H-series delay line to use with my modular synthesizer. I built a Jürgen Haible scanner chorus/vibrato module which is an all-electronic version of the Hammond Vibrato Scanner. There is a really nice article on Overhauling and Improving the Hammond M-100 Series Vibrato System at http://www.stefanv.com/electronics/hammond_vibrato_mod.html. 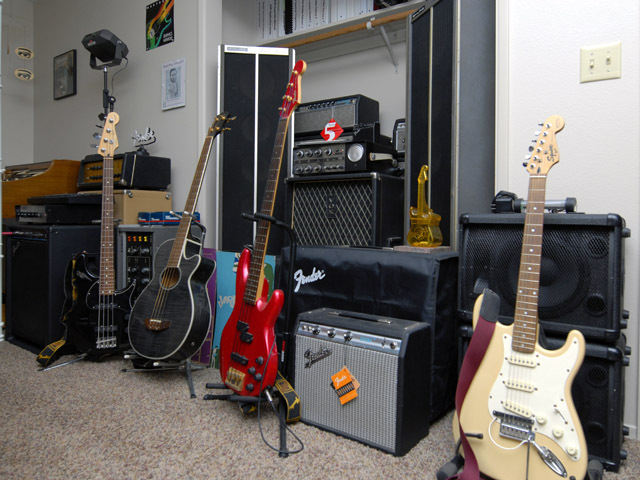 Here is some of my other music equipment. 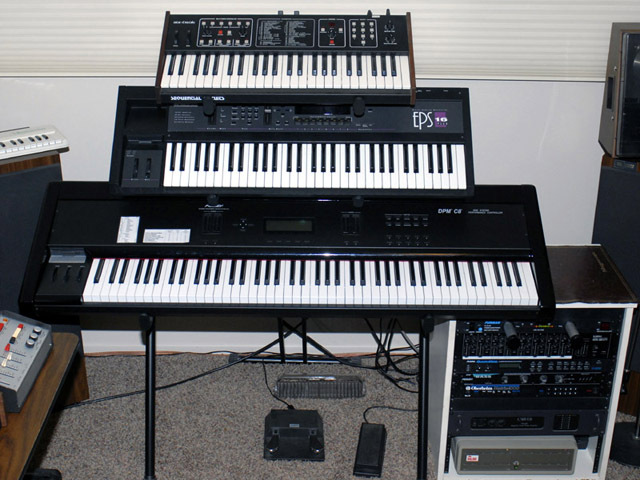 This stack consists of a Sequential Circuits Six-Trak, Ensoniq EPS-16+ with CD and hard drive, Peavey DPM-C8 88 key controller, Furman PL-Plus power conditioner, Kawai MX-8SR mixer, Alesis Quadraverb, Peavey DPM Spectrum Bass, Oberheim Matrix-1000, Carver PM-600 power amplifier, and a pair of JBL L100S speakers. 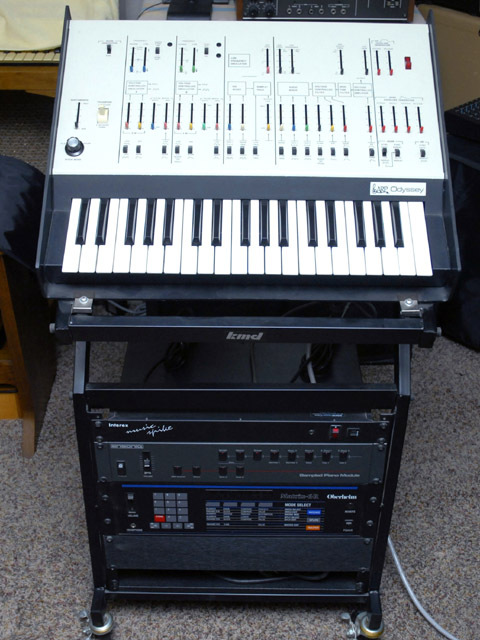 This stack consists of a Roland Juno-106, Ensoniq EPS-16+ with CD drive, 88 note MIDI keyboard¹, and MIDI bass pedals¹. 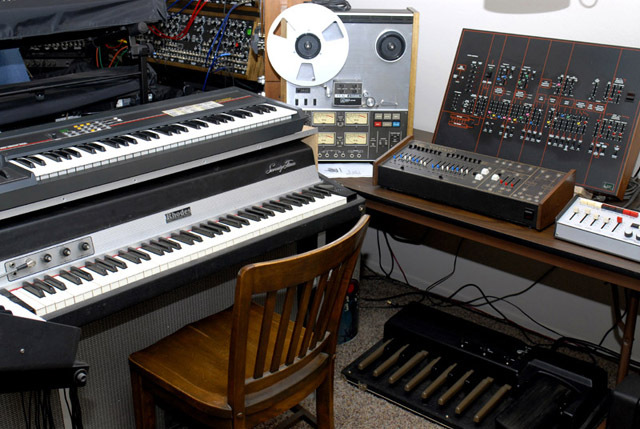 This rack consists of an ARP 2800 Odyssey, Ensoniq Sampled Piano, and an Oberheim Matrix-6R. Rounding out the studio is a Fender Rhodes 73 Suitcase, Ensoniq Mirage, Teac A-3340S, Arp Avatar and Sequencer, and a Crumar OMB2. The OMB2 is a "One Man Band" pedal system that generates drums, chords, and bass tracks for eight preset rhythms (built with TOGs and 4000 series CMOS). This closet consists of a my Fender amps - Dual Showman w/ JBL D130s, Twin Reverb w/ JBL D120s (covered), Bandmaster, Bassman, Champ, and a BXR 100. The rest of the gear consists of a Shure Vocalmaster with a pair of the tall speaker columns, Klemt Echolette S-100 (German) with a blond Bandmaster cabinet, Vox Essex Bass, Magnatone MP3 (behind the two Jordon Boss Amp posters), several Bogen PAs and speakers, bass guitars, and a Strat wired for my ARP Avatar. 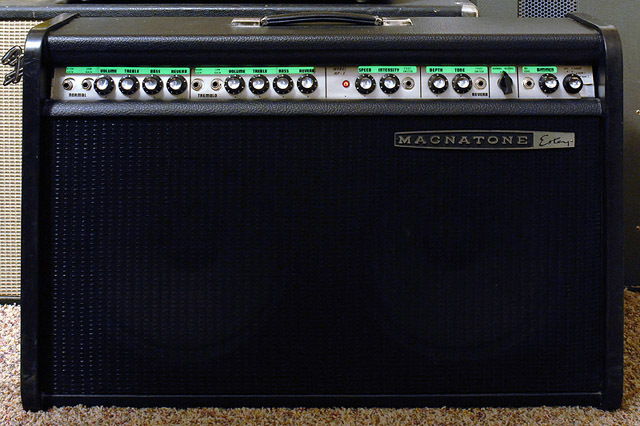 This is my restored 1966 Magnatone MP-3 guitar amplifier with the rear-lighted (electroluminescent) legends. This picture was taken with normal overhead lighting and the dimmer control on the lowest setting.